Synthetic peptide conjugated to KLH derived from within residues 800 - 900 of Human CPS1. WB: HeLa, A431 and HepG2 whole cell lysates. Our Abpromise guarantee covers the use of ab45956 in the following tested applications. WB Use a concentration of 1 µg/ml. Detects a band of approximately 150 kDa (predicted molecular weight: 140 kDa). ab45956 (1/500) staining CPS1 in HeLa cells (green). Cells were fixed in methanol and counterstained with DAPI in order to highlight the nucleus (red). Please refer to abreview for further experimental details. ICC/IF image of ab45956 stained human HeLa cells. 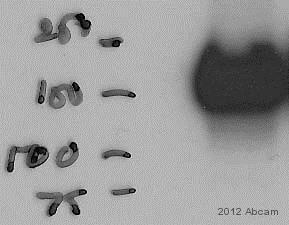 The cells were PFA fixed (10 min), permabilised in PBS-T (20 min) and incubated with the antibody (ab45956, 1µg/ml) for 1h at room temperature. 1%BSA / 10% normal goat serum / 0.3M glycine was used to quench autofluorescence and block non-specific protein-protein interactions. The secondary antibody (green) was Alexa Fluor® 488 goat anti-rabbit IgG (H+L) used at a 1/1000 dilution for 1h. Alexa Fluor® 594 WGA was used to label plasma membranes (red). DAPI was used to stain the cell nuclei (blue). IHC image of CPS1 staining in human liver carcinoma FFPE section, performed on a BondTM system using the standard protocol F. The section was pre-treated using heat mediated antigen retrieval with sodium citrate buffer (pH6, epitope retrieval solution 1) for 20 mins. The section was then incubated with ab45956, 1µg/ml, for 8 mins at room temperature and detected using an HRP conjugated compact polymer system. DAB was used as the chromogen. The section was then counterstained with haematoxylin and mounted with DPX. Immunohistochemistry (Frozen sections) - Anti-CPS1 antibody (ab45956)This image is courtesy of an anonymous abreview. 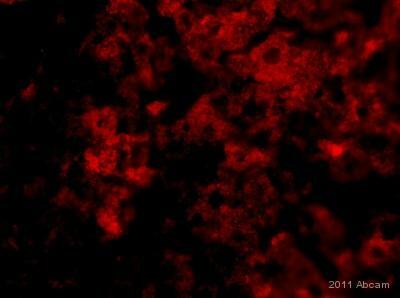 ab45956 (1/200) staining CPS1 in mouse liver sections (red). Tissue sections were fixed in formaldehyde, blocked and then stained overnight at 4°C. Please refer to abreview for further experimental details. Publishing research using ab45956? Please let us know so that we can cite the reference in this datasheet. Pls reply us the question from our customer, pls find below Email. I want to bring to your attention that for the detection of CPS1 as liver mitochondrial activity indicator I bought only anti-CPS1 antibody –liver mitochondrial marker (ab45956) abcam , would you please inform me: to do western blot technique can I use *** HRP kit as an indicator for the anti-CPS1 antibody, as it is available in my lab. This indicator kit consists of : biotinylated link, DAB chromogen, DAB substrate buffer. And streptavidin-HRP. Thank you in advance for your kind care given to this matter. Thank you for contacting us with your customer's question. The referenced kit is intended to be used with immunohistochemistry staining of tissue, and has not been optimized for Western blotting. It might be possible to get some results in Western blotting with this kit, but the buffers and dilutions are not intended for use in Western blot and the results may not be ideal. I would recommend using a DAB detection kit that has been developed for use in Western blot, which we do not currently sell but may be available on http://www.biocompare.com. Alternatively if the customer does not want to purchase a full kit,then she could use an HRP-conjugated secondary such as ab6721 (link is below)with just a Western blot DAB reagent. I hope this information will be useful, but please let me know ifthe customerhas any further questions or if there is anything else that I can do for you, and I'll be happy to help.